Oh, for the love of roses – I wanted to title this post – A Rose Romance! But that would’ve sounded more appropriate around Valentine’s time, isn’t it? Anyways, we are way past Valentine’s and almost into summers. And this calls for endless hours of languid lounging at the beach with your favorite book and goblets of lemonade! Um…kinda phenomenal! 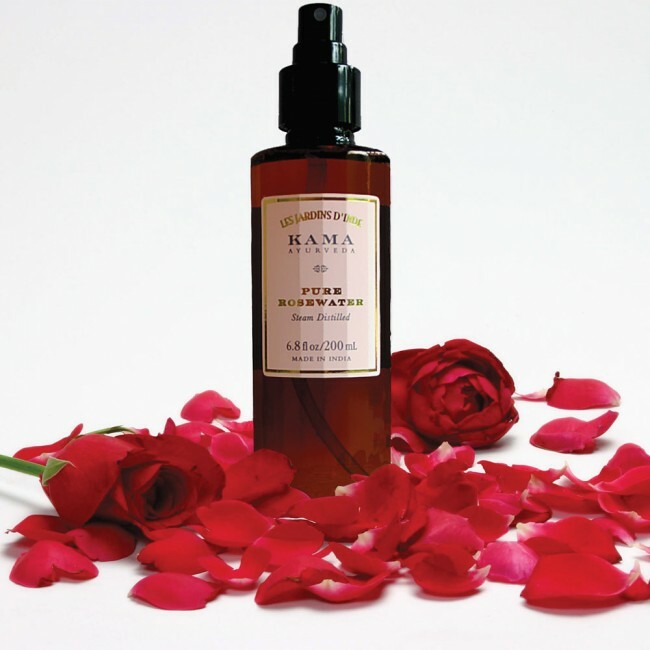 But even more phenomenal is this bottle of pure rose water from Kama Ayurveda – one of the Premium Ayurvedic Indian brands with an array of all natural skincare products. This is the only product I have tried from this brand so far and it has already made a fan of the brand – eagerly looking to try more of their natural skincare products. 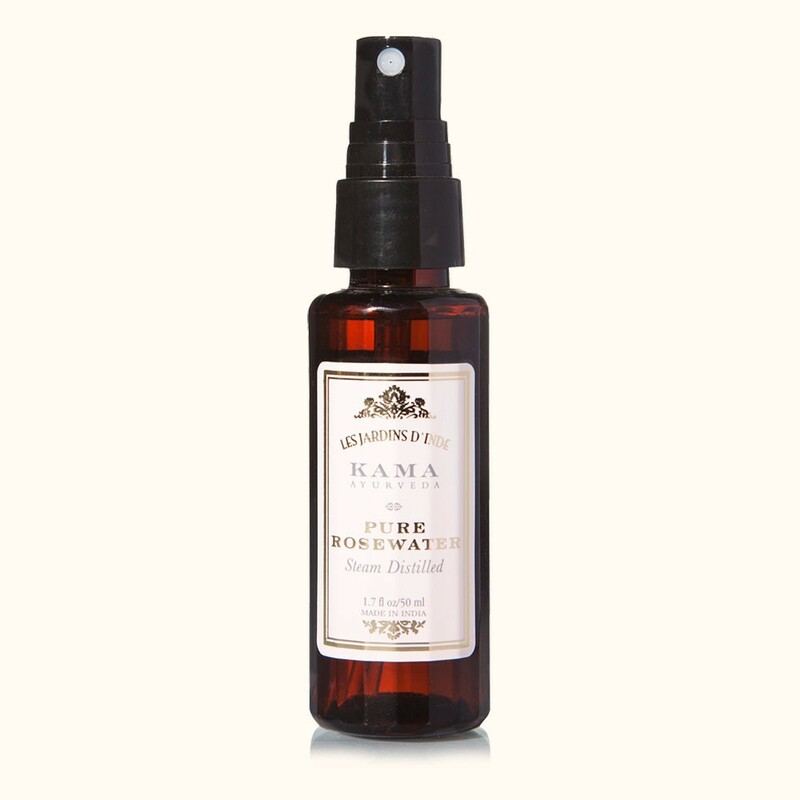 Kama Ayurveda rose water comes in a dark rose tinted spray mist bottle with black nozzle and transparent cap. The packaging looks plush, is travel-friendly and convenient to use. I love the scent of roses. And its subtle rose fragrance is completely divine and purely natural. I have English roses planted in my garden and I can easily tell the difference between natural rose scent and artificial rose fragrance found in most OTC rose-scented beauty products. I love the way the nozzle sprays just the right amount of product like a mist. It doesn’t drench your face like most other rose water spray bottles in the market but it does provides adequate moisturization to the skin. The best part is, this rose water is completely free from chemicals and you can use it in as many ways as you like. I use this rose water as a fine mist to freshen up my dull summer skin, as a toner to my daily CTM routine, as a mixing agent to my face pack, as a cleanser to wipe my baby’s face and finally as a finishing spray to set my make-up! You see how creative I am (or how versatile is this product). Whatever be the case, this rose water works wonder in whichever way you choose to use it. However, the only con I have found about this product is its price. It is way too expensive than most other rose water sprays in the market. There are many other rose water sprays in the market that do just the same job at half the price! But you got to pay for the indulgence. Overall, Kama ayurveda pure rose water is a great multipurpose product that keeps skin looking fresh and dewy. The best part about this rose water mist is that it’s made from purely natural ingredients. If you don’t mind shelling out a few more bucks for your skin, you should definitely give this natural rose water a try. I love Kama Ayurveda rose water. It is amazing and so gentle on the skin. I loved the Rose Romance, it sounds like a nice title! For every month! I hear that rose water is excellent, and I like dewy skin, so I would love to try this product! I have one that I also recommend, Melvita, but it has the same problem as this one – availability 🙁 Anyway, rose water is a must!